This is a page of brand specific information on the Paasche air brush compressors. Thousands of folks use them. A few recent questions and responses follow, then there is a posting form you can use to be part of this Paasche air brush compressor page. The first place to go for Paasche help is, of course: www.paascheairbrush.com. Yet if you still need help, this is the place. First, let me say that as a complete beginner to the world of airbrushing and especially compressed air, your site has been a lifesaver! I want to paint model airplanes with an airbrush. I don’t need to have a professional paint job with detailed engine smoke marks or bullet holes etc. I just want to move from assembling unpainted models to assembling models with say three colors or so — black propellers and wheels, a painted grey body and maybe a secondary color. For my needs, I can’t justify spending a LOT of money, at least not until I get pretty good with a beginner kit. I’ve selected a Paasche airbrush as a starter brush. I now need to find a compressor for less than $100 that will work well enough. I found the Paasche D500 and believe it has most of what you’ve listed as required, including a regulator, though I don’t believe it’s “precision,” and a filter. Therefore, I presume from their notes that this air compressor is not continuous duty cycle, but protects itself with an overheat thermal cut out. Therefore, spray on, and follow the instructions when it shuts itself off to cool down. “Hi! My small and noisy Paasche D500 (the little red one) just passed away last Friday 1st Jan at 10pm. My response is: I am sorry to hear about the passing of your little friend. Can it be fixed? No question. Can it be fixed at less cost than a new one? That’s the real issue. If you have the money and the equipment is worth it, it can be fixed, even if it means machining new parts etc. That, however is expensive. 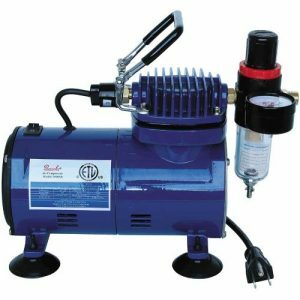 Check out the price of a new Paasche or other air brush type compressors and compare that to spending at least $100 to get the old one examined and the process of getting it fixed underway. What’s better for you? The Paasche airbrush compressors forum form follows. Post away!